When relying on woodcarving for one's only form of income, it is of course desirable to have a steady supply of commissions. However, as this usually means that the client chooses the subject, the chance to realise one's own imaginings becomes subverted to the matter of economics. Therefore, once in a while I try to buy my own time and carve one of the subjects that has been playing on my mind. - Its large size. Most of my work is small and fiddly and I fancied something I could really let rip on. - Laminated construction. I decided on this method because of the large size, and because laminating wood to make larger sculptures was a technique I needed to practise. - The subject matter. Sorry, but I like snakes. I worked for 15 years with various animals; one of which was a Burmese python (her name is Burma). Burma helped me with an educational animal display (and still helps keep me single). She was a big help when it came to reference. - Finally, I needed a fairly large piece to use at some carving demonstrations I had coming up and Serpent Dream would fit the bill nicely. Usually the design of a project goes hand in hand with wood selection. Invariably if you design and draw a most meticulous plan you will have to change it when the only wood that can be found is an inch too short. But as this piece was to be laminated from many planks, the design could take precedence. This would indeed be necessary, as only then would it be possible to calculate the quantity of timber required and its configuration. I made a maquette from Plasticine at approximately 1/4 scale and mounted on a wooden base marked with a grid of 11mm (7/16 in) squares; this relates to the approximate thickness of the planed-down 44mm (almost 2in) planks I would be using. The base was threaded to fit a tripod. 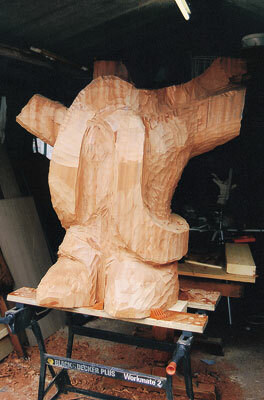 This meant I could alter the height, angle and positioning of the maquette when placed near the work in progress. I also made a shadow drawing to produce a silhouette. This was done by placing the maquette in front of a bright light source such as direct sunlight, so that it cast a sharp edged shadow onto a sheet of paper. I then drew around the shadow's edge. I enlarged it to the final size using a photocopier. Using the maquette and the grid lines on the base, I calculated how many 44 mm (approx 1 3/4 in) thick planks I would need to laminate together to obtain the correct depth of wood for the sculpture. I could also work out the length and width (dependent on availability) for each board, along with its position. Instead of just building a large, cuboidal block and carving from that, it would save time, material and money if I constructed part of the shape in the laminating stage. 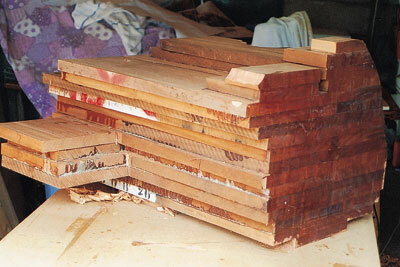 The timber I chose was sapele (Entandrophragma spp. ), mainly because of its low price (I required 2440mm3 [8 cubic ft>), ready availability and colour. After picking up the planks of sapele from the timber suppliers, I stopped off on the way home at a friendly wood yard that kindly put the lot through a planer/thicknesser so that it all came out at 44mm (approx 1 3/4 in). Once home the planks were cut to length, laid in position (horizontally), any extra planing and shaping carried out, then carefully marked to help in reconstruction. Only when completely happy with the fit and positioning of the planks did I begin gluing and clamping. The glue I chose was a waterproof, boat-building glue that foams in reaction with moisture in the wood and therefore has some filling ability as well as adhesion. I started with the planks that made up the middle of the sculpture; this was the broadest area and therefore the most important part to have completely flat. Then, working towards the back I glued and clamped just one layer at a time using a combination of sash clamps, G-clamps and barrels of water (as weights) to obtain an approximately even pressure in all directions. When the last of the back layers had dried, the whole thing was flipped over and the layers working towards the front were given the same treatment. Once all the planks were glued together, I could at last start the actual carving. But first I flattened the base and sealed the end-grain with glue to reduce the chances of splitting. For the same reason I always wrapped the block in plastic between carving sessions. To help transfer the information from the maquette to the block, I went through the following procedure. I first numbered the laminated layers (individual planks) on the side of the block, starting with 0 at the centre then working forwards to 10 and backwards to -6. The lines on the base of the maquette (looking from the side) were then marked in the same way. I then marked the centre of the grid on the base of the maquette looking from the front, and drew the same centre line, front and back, on the block. Using a graduated 90 degree set square, a pair of dividers, tape measure and a bit of mental arithmetic (the ability to multiply everything by 4); I was able to plot the position of all significant points of detail onto the block. Call me a cheat if you like, but I decided to do the bulk wood removal with an Arbortech wood carving tool on a 4 1/2 in angle-grinder. I started by refining the general shape using the enlarged silhouette template I had made earlier. Then, by transferring information from the maquette, the general line of where the snake would be draped was marked onto the block with a black chinagraph pencil and again the bulk of the wood was removed by the Arbortech. I always tend to err on the side of caution with the initial wood removal. It's easy to get carried away in the early stages and remove wood that later on you really wish you hadn't (especially when using something as hungry for wood as some power tools). After this stage it became a much more pleasant experience, as I could forego the dust and noise of machinery and instead confuse the local woodpeckers by propelling my 1 in (24 mm) No. 9 gouge through the wood with the aid of my trusty mallet. 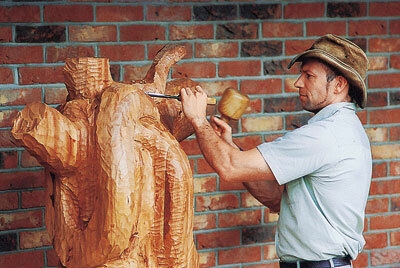 The majority of the shaping was carried out with this combination while demonstrating at woodcarving exhibitions. Constant referral to the maquette ensured that I didn't stray too far from the initial design. I find that the best way to tackle most woodcarvings, is to methodically work out the areas that you absolutely, definitely, do not need, and remove them. I know this sounds daft, but this works better for me than concentrating on areas I want to keep, which just happen to be lurking somewhere beneath the wood that isn't needed! When you have run out of wood that you don't want, then it must be finished. Of course that makes it sound easier than it really is, but you know what I'm getting at! Once the basic shapes were in the right places (predominantly that of the snake in relation to the tree stump,) I could begin work refining the details. I started by rounding off the back of the snake. It was tempting to undercut the belly of the snake so that it would start to look more recognisable, but if I'd done this too soon I would have committed myself to the lower limit of the snake. By the time the bark of the tree had been carved and finished, the snake may have appeared to be floating 5mm (3/16) above the surface it was supposed to be resting on. 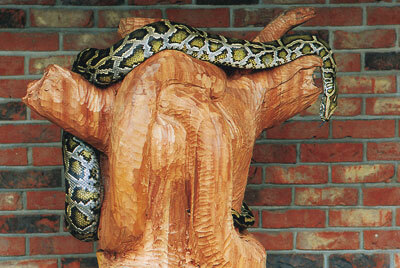 I therefore left the sides of the snake running straight down to the tree stump with no undercut. Work was then concentrated on the tree stump area, primarily taking the surface down to the final level of the finished bark effect. Once happy with this I could then continue shaping the snake under its belly and forming the undercut. I wanted to portray the feeling of weight in the snake (a 4.5m snake such as this would weigh in excess of 40 kg), along with an organic, soft quality. This would mean carving the cross-section of the snake wider at the belly than on the back to give it some 'flop'. I spread the width of the snake out where it rested over a raised bit of tree or when it crossed over its own body, to give it some visible 'squidge', and thinned the body out a bit where it hung straight down, providing some 'stretch'. You could say that I had to carve the effects of gravity. It was at this stage that Burma (the python) came to my assistance. Having a real life example of whatever you happen to be carving is definitely preferable to working solely from memory or from photographs. 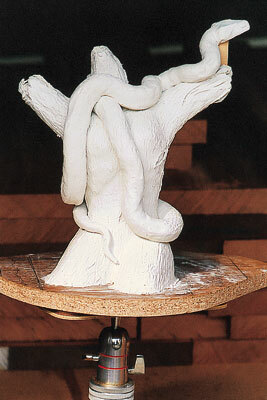 Once satisfied with the general shape, the surface of the snake was roughly smoothed off with a Microplane. This is similar to a rasp, but doesn't tear the wood fibres as deeply and leaves a good surface for marking, then tooling in, the scales. "Call me a cheat if you like, but I decided to do the bulk wood removal with an Arbortech"
The finished sculpture - guaranteed to ward off intruders! As the title suggests, I dreamt the basic idea, and as usual, at the moment of waking, it seemed like the best idea since sliced bread. However, the cruel light of day soon faded my initial enthusiasm. Nevertheless, I decided that it still had some merit and I would carve it anyway. 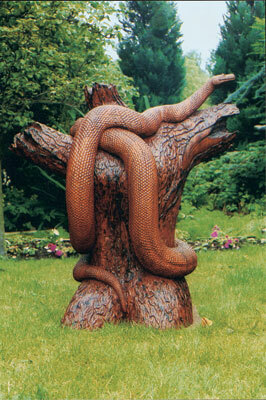 The sculpture consists of a large snake entwined around a lightning-struck tree stump that bears a passing resemblance to a female torso. As for the meaning? I have my own favourite interpretation, but when it comes to abstracts and symbolic sculptures perhaps it's best not to prompt the observer. It may mean something to some people and absolutely nothing to others, which is fine by me. A couple of points on laminating: don't tackle too many layers in one go. It can get a bit messy when you discover a small anomaly that would have been an easy matter to fix had you not got quite so many glue-covered planks to deal with. Sod's law will also ensure that any large gluing jobs will occur on the hottest day since records began (which reduces your time to sort out any unforeseen problems). During dry-assembly drill a couple of small holes through each plank in an area within the sculpture that is not going to be exposed at the surface when carving. These holes should extend into the plank beneath. When gluing up, insert cocktail sticks into these holes to prevent the wood sliding out of position during clamping. Now let's tackle that old chestnut of whether to laminate the planks heartwood side to heartwood, or heartwood side to sapwood. After talking to several people, I chose to laminate the planks heartwood to heartwood and sapwood to sapwood. However, I now believe this was wrong for planks of the thickness I was using. When laminating blocks of moderate width and a thickness of more than 75mm (3ins), I think this would be fine, but for wide boards only 38mm (1 3/4in) thick I believe that heartwood side against sapwood side is the way to go. The reason for this, in my mind, is as follows. 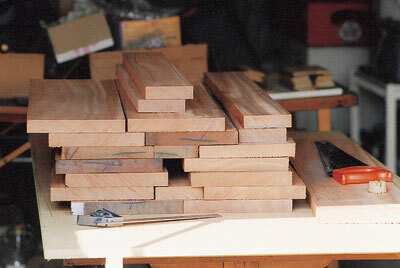 Thinner, wider boards can develop a curvature with the outer edges bending away from the heartwood side. Therefore it would make some sense if the boards being glued to it would also bend in the same fashion. This would equate to the heartwood to sapwood method. When laminating thicker boards, there won't be as much bending, but the important feature will be the amount of shrinking across the width of a board. This will mean that sapwood sides would shrink similarly, as would the heartwood sides. Hence the 'like to like' approach. is it a bird?...is it a plane?